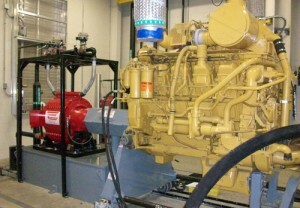 June 27, 2014 - "Company News"
An engine dynamometer (dyno) is a major investment and if not maintained properly it can perform less effective, especially when you’re testing to the dynamometer’s capacity. Learn eight ways to maximize the life of your engine dyno to help deliver the best overall value in the form of lower downtime, superior performance and higher return on investment. High discharge water temperature causes impurities to form on the rotors and stators within your dynamometer, preventing full displacement of water. 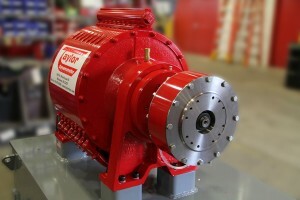 This is usually caused when the dynamometer reaches a high discharge temperature, typically over 175°F (79°C). When this occurs, impurities from the water build up internally in the dynamometer and begin filling the voids that are used to create dynamometer load. As these pockets fill, the dynamometer begins to reduce the amount of load to your engine, in turn making your dynamometer perform less effective. If you suspect impurities in your water, contact a local water treatment facility to test your water. You’ll receive information on your water quality and what steps are necessary to improve your water quality and minimize calcification and scale within your water system. A Water Treatment and Filtration System is a synergistic, self-contained, chemical-free system that keeps your water and pipes clean. The system aids in removing the impurities by ionizing the water and collecting the sediment that can accumulate in the voids within the dynamometer. 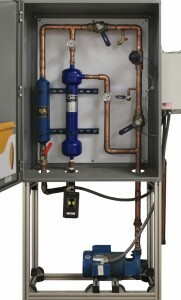 This system is a stand-alone product that includes a circulation pump separate from the water recirculation/cooling system. The Water Treatment and Filtration System will not interfere with the operation of your cooling tower. Packing material is used to maintain the water within the dynamometer. The packing requires replacing on a regular basis to prevent poor sealing around the shaft. The packing should always be moist. To maintain moisture, adjust the packing nut so there are approximately 30 – 60 drips of water per minute coming out of the packing area. If there is more water than this coming out of the unit, the packing nut needs to be adjusted. If you cannot adjust the packing nut or the packing material is completely dried out, new packing material may be required. If you have to install new packing material make sure that the packing is installed correctly, otherwise the water pressure will not be able to build up in the dynamometer cavity and load will not be achieved. Contact your Taylor Dynamometer Service Representative for assistance with this process. The main shaft is supported by two oil bearings that must sustain proper oil levels. If the oil is not maintained, bearing failure may occur. Use SAE 10 weight or ISO VG32 oil. The dynamometer’s most vulnerable area is where it meets with another dynamometer or engine. To prevent premature bearing and driveshaft failures, it is recommended a Torsional Resilient Coupling or a Vibration Dampening Driveshaft be used to manage the torsional vibrations. This especially holds true when running engines less than 3,000 ft-lb of torque. Maintenance and inspections must be performed on your Torsional Resilient Coupling or your Vibration Dampening Driveshaft. Although there is not a standard amount of time to follow for replacing these parts, proper maintenance will help extend their life. Contact Taylor for options on larger engines. Regularly checking system calibration will allow you to detect and correct instrumentation issues before they impact your business. Furthermore, calibration should be checked when data doesn’t look “quite right.” If your system is operational, but you suspect it may be providing inaccurate data, you may want to calibrate all input channels. Inaccuracies can be discovered on temperature, pressure and torque channels when placing a known (correct) value in and then checking the results. For example, if it is 70°F (21°C) in your test cell but your temperature probe is reading 85°F (29°C), then your system is probably due for a calibration check. If you have the proper calibration testing equipment, and you feel comfortable with the calibrating process, then you can perform the calibration checks yourself. Refer to your Taylor Dynamometer operation manuals for assistance. For calibration checks performed onsite at your location, contact your Taylor Dynamometer Service Representative. Your representative will provide a certified calibration inspection document upon complete calibration of your system. Ensure all employees receive proper training and have a clear understanding on how to operate the dynamometer and test cell equipment. Remember to train new employees and contact your Taylor Dynamometer Service Representative to provide training on best practices, latest advancements, upgrades and even refresher courses as a safeguard to your employees, company and equipment. Routine maintenance, as those mentioned above, and others can help deliver the best overall value of your dynamometer and testing equipment ensuring that you get the most out of your equipment over its entire life cycle. All owners of Taylor Dynamometer products receive unlimited phone, fax and email support. So call us today if you have a question about your system. For more information on how to maximize the life of your engine dynamometer, contact Taylor Dynamometer (414) 755-0040, service@taylordyno.com. Taylor Dynamometer – your partner for superior dyno system performance. Everything we do is about making it easy for you to turn your testing challenges into success.